전탑(塼塔)이란 흙으로 만든 벽돌을 이용하여 쌓아 올린 탑으로 통일신라시대에 창건된 법흥사에 속해있던 탑으로 추정된다. 탑은 1단의 기단(基壇)위로 7층의 탑신(塔身)을 착실히 쌓아올린 모습이다. 기단의 각 면에는 화강암으로 조각된 8부중상(八部衆像)과 사천왕상(四天王像)을 세워놓았고, 기단 남쪽 면에는 계단을 설치하여 1층 몸돌에 만들어진 감실(龕室:불상을 모시는 방)을 향하도록 하였다. 탑신은 진한 회색의 무늬없는 벽돌로 쌓아 올렸으며, 지붕돌은 위아래 모두 계단모양의 층단을 이루는 일반적인 전탑양식과는 달리, 윗면에 남아 있는 흔적으로 보아 기와를 얹었던 것으로 보인다. 기단의 윗면을 시멘트로 발라 놓아 아쉬움을 남기는 이 탑은 7층이나 되는 높은 층수에 높이 17m, 기단너비 7.75m의 거대한 탑임에도 매우 안정된 자태를 유지하고 있으며, 국내에 남아있는 가장 크고 오래된 전탑에 속한다는 점에서 중요한 의의를 가진다. 또한 지붕에 기와를 얹었던 자취가 있는 것으로 보아 목탑을 모방하여 전탑이 만들어졌다는 것을 입증해 주는 자료로 평가되고 있다. Standing 17m tall, the Seven-story Brick Pagoda at the Beopheungsa Temple Site is the largest and oldest brick pagoda remaining in Korea. 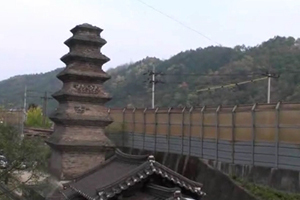 Given that the name of the site where the pagoda stands is Beopheung-ri, it is assumed that the pagoda used to belong to Beopheungsa, a Buddhist temple built during the Unified Silla Period. 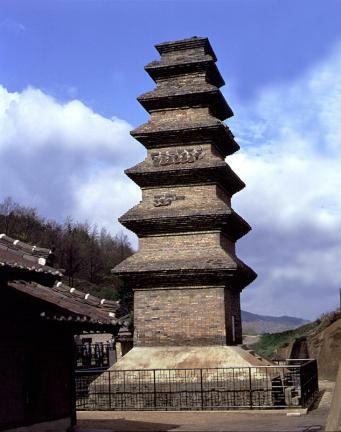 The pagoda’s body stands on a single-story platform, and is made of firmly cumulated bricks. 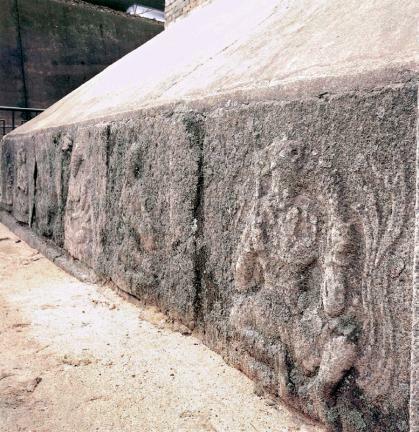 Eight Guardian Deities and Four Guardian Kings are carved out of granite on each side of the pedestal, while on the southern side there is stairway leading to the niche in the body of the first floor. Unfortunately, the upper side of the platform is now cemented. 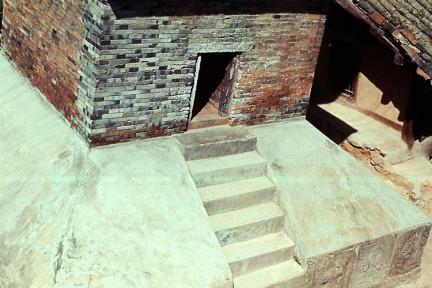 The body is made of dark gray bricks without patterns, and there is a niche at the center of the first floor in which a Buddha statue would have been enshrined. 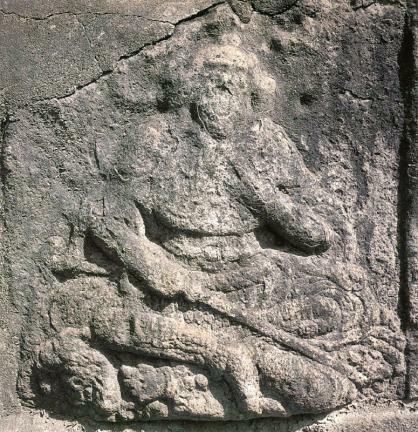 The roofstone has a mark that shows there were roof tiles on its upper side, which is very different from common brick pagodas whose upper and lower roofstones are staircase-shaped. Though the pagoda is a high seven-story pagoda, it looks very stable. 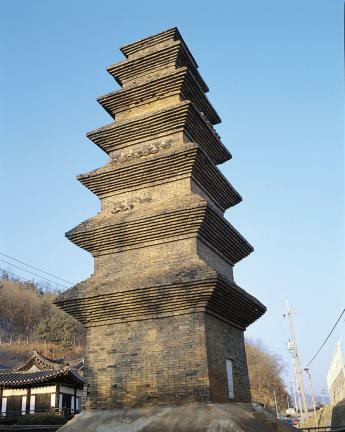 Considering that there is the mark of roofing tiles on the roof, it is estimated as a material that proves that the brick pagoda was built by imitating the appearance of wooden pagodas.